One of the things that makes it so easy to get really, really invested in Star Wars is all of the interestingly designed and individually maintained creatures that serve as little more than set-dressing, especially for the Original Trilogy, where each of them had to be crafted through intense prosthesis or advanced puppetry. 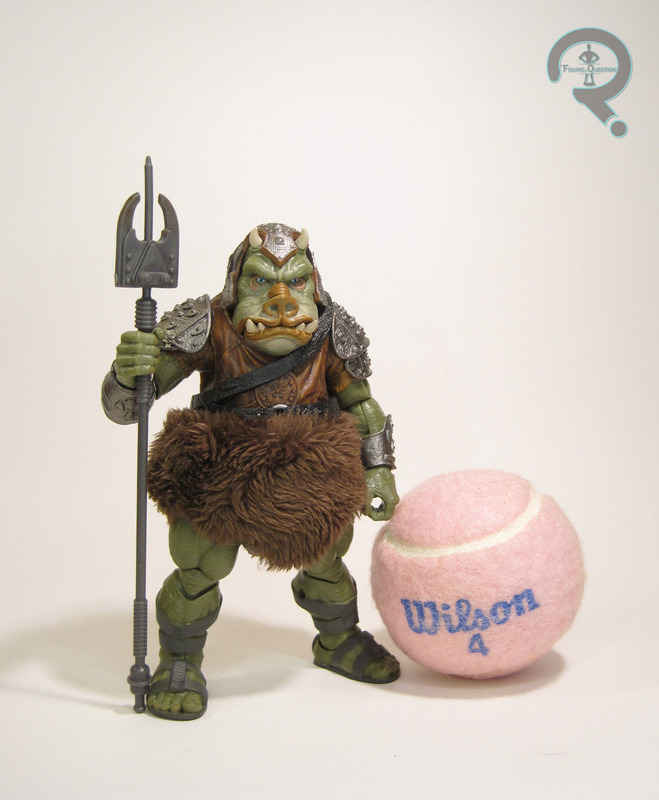 Sometimes, it was even a combination of the two, as was the case for today’s focus, the Gamorrean Guard. 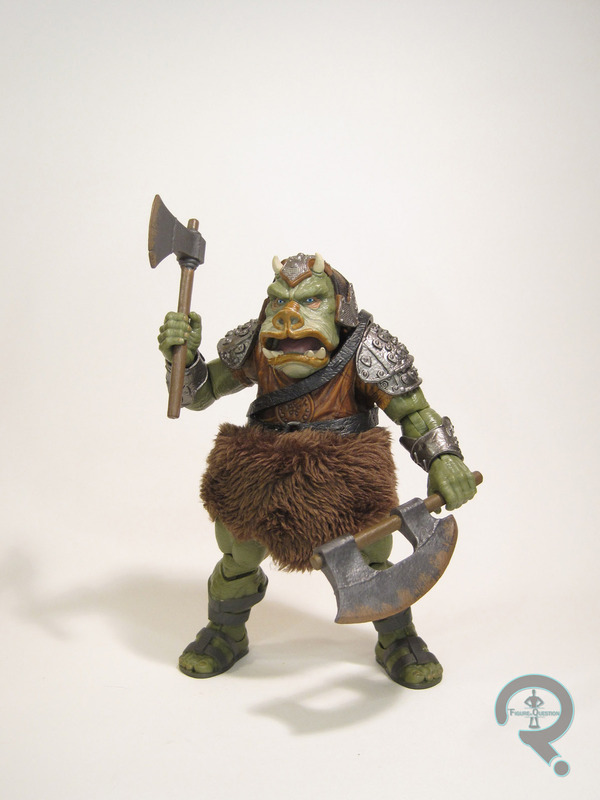 The Gamorrean Guard is kind of the Star Wars: The Black Series counterpart to the Archangel I reviewed last week. He’s the first figure in a sub-set of deluxe offerings for the line. He’s already been followed by Molloch from Solo (who I’m all but positive will be available at a Target near you for many, many years to come) and will be followed up again by General Grievous some time next year. The Guard is a Target-exclusive, but it doesn’t look like the others in the line will be. Time will tell. The Guard is, of course, based on its appearance from Return of the Jedi. The figure stands 5 1/2 inches tall and has 28 points of articulation, which includes a posable jaw. I appreciate that Hasbro is continuing to work that feature into the more inhuman figures. The Guard is actually surprisingly mobile, given his design; Hasbro’s put a lot of effort into giving him the most sensible and efficient articulation possible. His unique design also warrants a unique sculpt, and, like all of the more out-there aliens we’ve gotten from this line, it’s quite a good sculpt. Hasbro’s clearly had some fun with this one, and there’s just a ton of detailing worked it, from the slight texturing of the skin to the un-even patch-work stitching of his leather vest. Elements such as the armored plates on the shoulders, the straps on his torso, and his helmet are separate parts, giving the sculpt a nice sense of depth, and allowing for each of those parts to have all of its proper detailing. The loin cloth is made from faux-fur, which is a fairly traditional way of handling this part of the design in toy form. I’m always a little skeptical about the mixed media offerings on Black Series figures, but Hasbro definitely made the right choice here; the fur just wouldn’t have looked right any other way. The Guard’s paintwork is fairly standard faire for the line at this point, which is to say it’s nicely rendered, and suitably subtle. It’s not going to knock anyone’s socks off, but it certainly gets the job done. The Gamorrean Guard is packed with two axes and a staff, as seen wielded by different Guards throughout the Palace sequences of the film, thereby allowing for a bit of army building, if that’s your prerogative. The Guard had, initially anyway, proved rather illusive for a good number of collectors. He showed up on Target’s site several months back, and people were able to place pre-orders, but those took their sweet time getting out there, and the figures took even longer to make it to store shelves. I found one a couple of months ago, but I opted to spend the money on something else at the time, and when I made it back, he was long gone. Fortunately, I lucked into a fresh case of them a couple of weeks ago, while I was out and about with Super Awesome Fiancee. I like this figure overall. The Guard was never a particular favorite of mine, but he does translate well to the Black Series style. I’m cautiously approaching the rest of this “deluxe” line, though. The Guard feels a little light for the heightened price, and Moloch even more-so. I worry that Hasbro’s going to price themselves out of this line before they get a chance to really explore the style.